Ken's Blog - Writer & Developer. This is my personal blog. According to an IMechE report earlier this year, between “30-50% of all food produced on the planet is lost before reaching a human stomach”. It’s a number that should concern every one of us: food waste causes the average household to be £480 worse off every year and also has environmental impact in terms of wasted resources. Within the UK, the amount of food that we throw away is staggering. As a nation, we collectively throw away 7.2 million tonnes of food and drink every year. That’s equivalent in weight to 18,000 jumbo jets. The most compelling reason to reduce food waste is that it will save you lots of money. 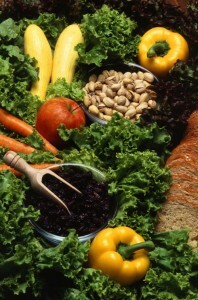 According to government statistics, groceries are the fourth biggest item of expenditure in a typical household budget. On average, British households spend £2,857 per year on “food and non-alcoholic drinks” (£54.80 per week). Of this, £480 of food is simply thrown away. By reducing food waste, households can save themselves hundreds of pounds every year. 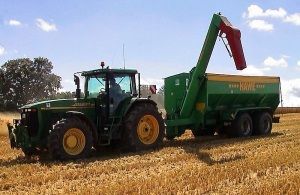 Food production is resource-intensive: 72% of land in the UK is given over to food production. 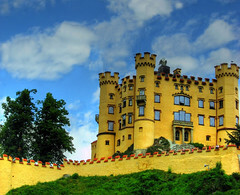 CC-licensed image from Wikipedia. Another reason that compels us to reduce food waste is its impact on the environment. Producing food is a resource-intensive process: as a nation we dedicate 72% of our land to food production. 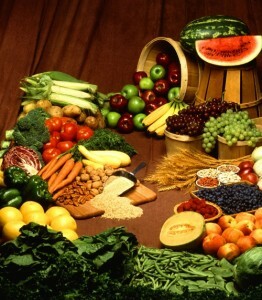 Food production also consumes a large amount of energy, water and soil fertilisers. When food is thrown away needlessly, resources are wasted down the entire production line. With a rapidly growing population and dwindling natural resources, it should be our moral obligation to reduce food waste. As individuals, there are two ways we can reduce food waste. The first is making better use of leftover ingredients: we should find ways to eat the food that we have rather than throwing it away. The second is the mantra of “waste not, want not”: buying only the food that we actually need. In this article, we’ll look at some applications for your tablet that can help you to achieve these objectives. When there’s leftover ingredients in the fridge, it’s not always easy to know how they can be used. Cooking with leftovers can sometimes feel like ‘Ready Steady Cook’: there’s a mish-mash of seemingly random ingredients, all leftover from different meals. With no obvious way to use them up, a lot of those ingredients eventually make their way to the trash. Your tablet can help in this regard by giving you culinary inspiration. When it comes to leftover ingredients, my favourite tablet app for recipe ideas is Epicurious. It’s available as a free download on the iPad. The app has a database of more than 30,000 recipes, though what’s particularly useful is the ability to find recipes based on the ingredients within them. By restricting your recipe search to only the food that’s available in your fridge, the app can help you to use up leftovers. As tablets give you access to a more extensive recipe collection than cookbooks, it should always be possible to find something that’s new and different. I’ve been positively surprised by some of the delicious dishes you can make from ingredients in the fridge. One of my favourite “leftover” recipes is bread and apple pudding. 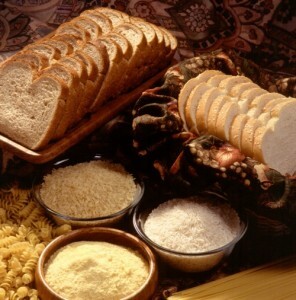 It’s a great way of using up stale bread and it’s fairly simple to make and bake. Bread pudding goes well with apple but it also complement other fruits like strawberries and pears. Why not try the recipe with the fruit you have available? Bubble and Squeak – Bubble and Squeak can make a simple week night dinner. 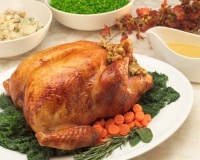 The recipe is incredibly flexible – it accommodates almost any type of vegetable. My recommendation is to use the vegetables that were leftover from Sunday lunch. Curry Chicken Salad – I absolutely love this recipe. Combine leftover chicken with salad leaves and mix it with some mayonnaise and curry powder. Simply delicious. Vegetable Soup – This one’s perfect for keeping warm in the winter (and apparently the spring too). Vegetable soup is incredibly versatile – you can use almost any veg that’s in the fridge. Whilst you’re cooking, the tablet version of Epicurious is ideal. The application has a full-screen “cookbook” view with a detailed list of ingredients, high-resolution photos and step-by-step instructions. If you don’t have a tablet, you can use the equivalent smartphone application. 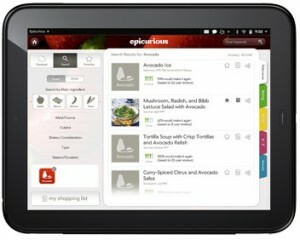 Epicurious is also available on iPhone, Android & Windows Phone devices. One of the reasons so much food goes to waste is that we often buy things we don’t need. Without careful planning, it’s easy to get carried away: you could buy too much food or you could buy something that you already have in the fridge. By keeping a shopping list and sticking to it, you’ll stop yourself from wasting money on food you won’t eat. Whilst a paper shopping list can do the job, I find it much more convenient to keep a shopping list on my tablet. 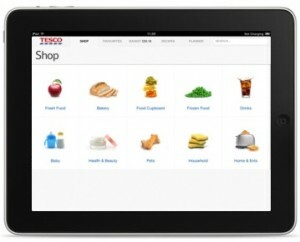 My favourite app for maintaining a shopping list is Tesco’s iPad application. The app is dead easy to use: whenever you run out of something, simply take a photo of the product or scan its barcode. The app recognises the product and automatically adds it to your shopping list. You’ll also see an indication of its price which can be helpful when budgeting. What makes the Tesco service particularly useful is the fact it also works on smartphone devices. You can download a Tesco app for your iPhone, Android or Windows Phone device. Providing you sign in to the same account on your devices, the shopping list will be synchronised automatically on all of your smartphones and tablets. This means your whole family can contribute to the shopping list, either using an iPad or their own smartphone. 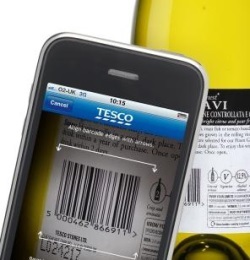 You can add a product to your shopping list by scanning its barcode. This can be done on a tablet or on a smartphone when you’re away from home. When it comes to actually doing your weekly shop, Tesco customers can place an online order through the iPad application. If you normally shop at a different supermarket or you prefer to shop in-store, there’s no problem: just use the app as a shopping list and ignore the options to checkout. By making use of a shopping list, you can become more disciplined at the supermarket. Sticking to your shopping list will prevent you from buying unnecessary things: this keeps your grocery bills down and will ultimately reduce the amount of food that gets thrown away. As a nation, we waste a lot of good food. Every year, the average household in Britain spends £480 on food that gets thrown away. This is a big waste of money and a huge waste of environmental resources. By reducing food waste, we can ultimately save hundreds of pounds every year whilst also helping the environment. The main ways to reduce food waste are to make better use of leftover ingredients and to shop more effectively at the supermarket. Epicurious is a fantastic app if you’re looking for inspiration on what to do with leftovers. Get it on your tablet for the “cookbook viewing mode” and use the “Search by ingredients” feature for recipe ideas. When it comes to doing the weekly shop, having a household shopping list can be invaluable. The Tesco application is ideal for this: it’s easy to add products by taking a photo or scanning a barcode and you can synchronise the shopping list across your family’s smartphone and tablet devices. Keep to the list and you’ll avoid buying things you won’t use. With increasing food prices forming an ever-larger part of the household budget, reducing the amount of food you throw away can be a simple and effective way to save money. Using the right apps on your tablet, that job can be made even easier. For this reason, I consider these apps to be some of the best money saving apps on a tablet. After the roast turkey and mulled wine are packed away this Christmas, many Brits can be forgiven for heading straight to the gym and making a New Year’s Resolution to get fit. Yet an annual gym membership can cost upwards of £500 per year – hard to square up when you’re also making a New Year’s Resolution to save money and to get out of debt. Thankfully, the wonders of modern smartphone technology have made it possible to work out and to get fit without going to the gym. You can exercise wherever and whenever it is convenient to you and you can even measure how your body is responding to exercise. Simply download some free applications on your Android smartphone and you’ll be on your way to getting fit without a £500 gym membership. One of the best ways of getting fit is to integrate exercise into your daily life – for example jogging around the neighbourhood in the morning whilst you’re on your way to pick up the morning newspaper and a pint of milk. One reason why its popular to work out at the gym is that we can keep a track of our progress – the treadmills will keep track of how far we run, how many calories we burn and whether we manage to reach the desired heart rate training zone (in order to improve your cardiovascular fitness, you should aim for your heart rate to reach around 75% of your maximum heart rate). 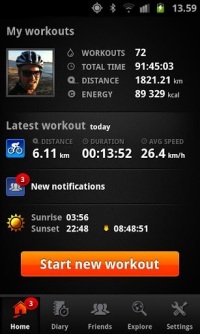 My favourite fitness application for Android is Sports Tracker (free). Set it up before you leave the house and the application will make use of your phone’s GPS tracking capabilities to measure how far you’re running, how fast you’re running and how many calories you’re burning. This is all displayed in a simple and easy-to-use interface. Once you’ve finished your run, you can let your friends know about it through Facebook and Twitter – researchers have found that we’re more successful at keeping resolutions when we let other people know about them. All of your runs are also recorded in your “Diary” allowing you to measure your progress. Another thing that some gym treadmills do is to monitor your heart rate. This is how you can determine whether you are training within your target heart rate zone. On Android, this can be achieved using a clever little application called Instant Heart Rate (free). 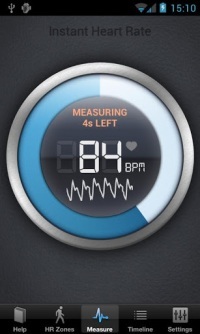 Instant Heart Rate uses the camera and LED flash capabilities of your Android device to measure your heart rate. It’s dead easy to use: simply place your finger on the camera lens and it’ll tell you your current heart rate. As your heart beats, blood is pumped around your body causing the capillaries in your finger to expand. This gives a small change in the colour of your finger which is what the application is looking out for when measuring your pulse. The LED flash simply provides a source of light illumination so it can all work. It’s essentially how medical pulse oximeters work. Hopefully you won’t need persuading that running outside is more fun than running in a gym: not only can you get some fresh air but you’ll also be able to take in the sights and sounds of your local neighbourhood. 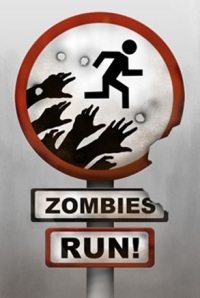 If you’re still looking to spice up your run, an interesting app to check out is Zombies, Run! It’s an augmented reality application which immerses you in the midst of a zombie invasion. The stories and missions are played out through your headphones and the only way you’ll survive is to run. The application makes use of your current location (via GPS) for storytelling. Whilst this app might not be for everyone, it certainly isn’t your bog-standard run at a gym treadmill. Zombies, Run! costs just under £5 from the Google Play store. At £500 per year, a gym membership certainly isn’t for everyone. Many of us would like to work out without the expense of a gym membership and with the convenience of being able to exercise wherever and whenever we want. The Sports Tracker application for Android (free) will measure all of your workouts including how far you run, how fast you go and how many calories you burn. It will also help you to visualise how your fitness has improved over time and allows you to involve your friends and family in your workout routine. The Instant Heart Rate application for Android (free) will help you in determining whether you’re training within your desired heart rate zone. Working out at around 75% of your maximum heat rate will lead to improved cardiovascular fitness in the long run. The Zombies, Run! application for Android (£5) turns your daily run into an adventure that takes place around your neighbourhood. Who said that working out needs to be a chore, when it can be a game instead? By making use of some of the latest Android apps, you can get fit for a fraction of the cost of a traditional gym membership. One of the best money saving apps of the year? I certainly think so. Like every other Olympic Games in modern history, this year’s Olympic Games which is being held in London has also been preceded by a Torch Relay. London saw a brief glimpse of the Olympic Torch four years ago during Beijing 2008 torch relay. Under the motto “One World, One Dream”, the Beijing torch passed through dozens of countries including the UK on April 6th 2008. This gave us a small taster of what we’d see in this year’s torch relay. With London 2012, games organisers have decided that rather than having an international Torch Relay around the world, the Torch Relay should instead focus upon showcasing the best of Britain – the landmarks, the communities and the local heroes. The Torch is currently making it’s way across the UK through 1,019 communities being carried by community heroes. Each day’s relay culminates in an evening concert and celebration to celebrate the arrival of the torch. A vital aspect of putting on the modern Olympic Games is the sponsorship deals that come with it and the commercial aspects of the Torch Relay. 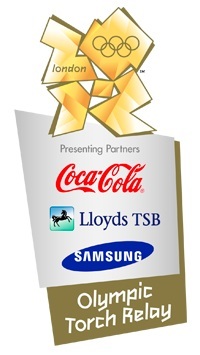 For the 2012 Olympic Torch Relay, there are three Presenting Partners: Coca-Cola, Lloyds TSB and Samsung. Along with several other Mob!lers, I had the amazing opportunity to attend the Torch Relay festival in Leeds. 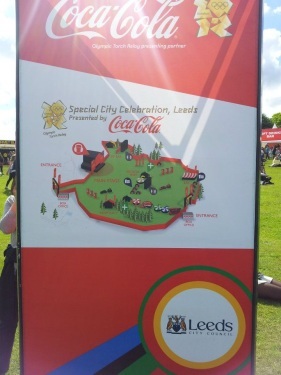 In this article, I explore the commercial aspects of the Torch Relay and compare how Coca-Cola and Samsung are marketing themselves around the Temple Newsam festival site in Leeds. Coca-Cola have been a key sponsor of the Olympic Games since 1928 and are one of the main Presenting Partners of the London 2012 Olympic Torch Relay. With Coca-Cola being the world’s most valuable brand according to the Interbrand list of “Top 100 Global Brands” (it has a brand value of $71.8bn), it’s somewhat a surprise that Coca-Cola have spent so much money on the Olympics and sponsoring the Torch Relay. Indeed, it’s hard to imagine there’s anybody in the UK hasn’t tried Coca-Cola before. This leaves the obvious question of how sponsoring the Torch Relay will help to increase the customer base of Coca-Cola and improve their brand value. 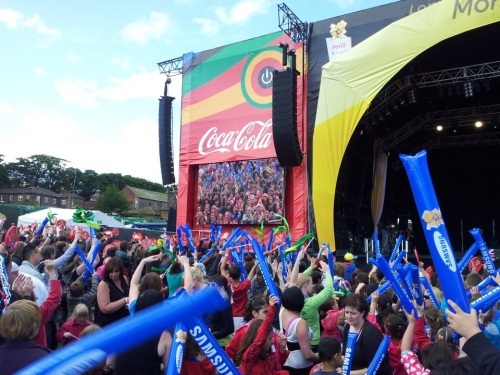 The Olympic Torch celebrations at Leeds were fully Coca-Cola branded. This involved the naming rights for the event as well as branding the entire stage with Coca-Cola signage. As a bizarre experience that you’re likely to tell all of your friends about, this “moment of happiness” certainly ranks high on the list. Aside from the “Moments of Happiness” being performed around the site, Coca-Cola also distributed ice cold drinks free of charge to punters in special Torch Relay souvenir bottles. 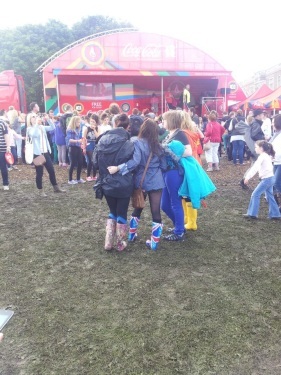 Coca-Cola placed one of their trucks near the entrance of the (rather muddy) Temple Newsam festival site in Leeds. 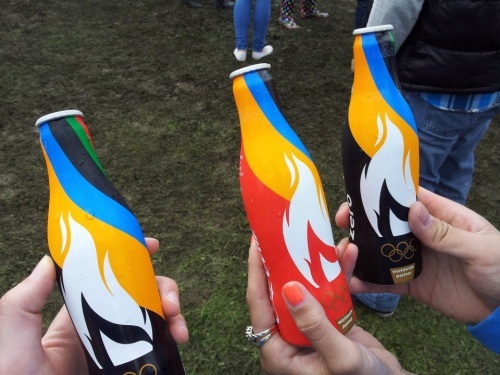 Punters were offered a free limited edition “Olympic Torch” bottle of Coca-Cola. Samsung has been one of the world’s fastest growing consumer brands in the past decade. It is currently ranked 17th in the Interbrand Index with a brand value of $23.4bn – a figure that is aiming to improve upon with their involvement in the Olympics. Samsung began their Olympic journey as a domestic sponsor of the Seoul 1988 games and continues as a sponsor of the Olympics during London 2012. They are also a presenting partner of the London 2012 Torch Relay. According to Samsung, the aim of their Olympic involvement is to see “not just immediate return but long-term returns in increased awareness and brand preference”. With the Samsung Galaxy S III being the official smartphone of the London 2012 Olympic Games, Samsung were making a lot of effort to showcase the phone to punters at the Olympic Torch Festival in Leeds. A section of the festival site was dedicated to showing off the Galaxy S III with festival goers queuing up for the chance to have a caricature drawn of them using the Galaxy Note and to have their photo taken with the Olympic Torch. This extends upon the Galaxy Note Studio concept, which Samsung first showed off in Barcelona during Mobile World Congress 2012, by taking it on the road to follow the torch. 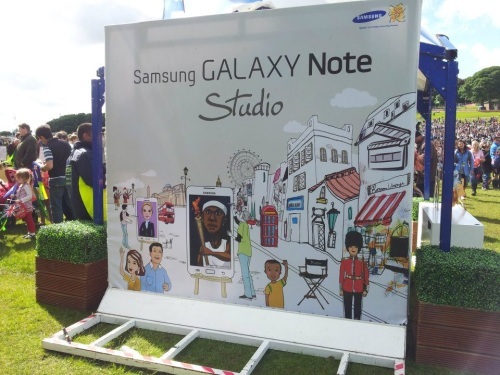 Samsung have taken the “Galaxy Note Studio” on tour with the Olympic Torch. First shown off in Barcelona during Mobile World Congress 2012, the Galaxy Note Studio allows punters to have a free caricature drawn of them on the Galaxy Note. During the performances themselves, Samsung presented dance act Twist and Pulse from Britain’s Got Talent as well as the dance troupe Diversity. Both acts went down well with the crowds in Temple Newsam with a panoramic photograph being taken of everybody using the Galaxy S3 at the culmination of the event. Event goers have been encouraged to tag themselves on the Samsung website where the photographs have been posted online. 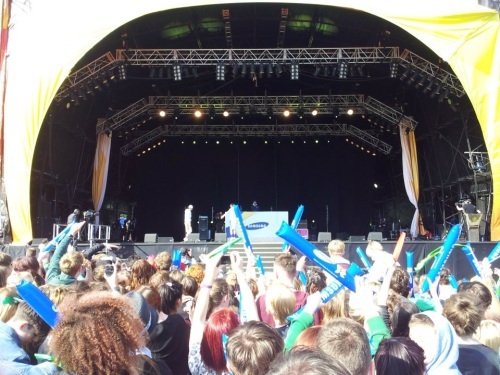 Samsung presented ‘Twist and Pulse’ from Britain’s Got Talent at the Torch Relay celebrations as well as ‘Diversity’. 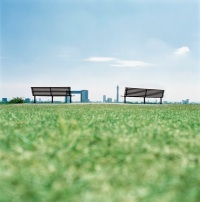 With their Olympic marketing activities, Samsung are hoping to boost awareness of their two flagship devices, the Galaxy S III and the Galaxy Note. This can be seen in the way that they promote their products around the site. Whereas Coca-Cola’s marketing activities tend to be more experiential and less about products, Samsung’s on-site marketing activities are more product-focussed with the aim of showcasing their flagship devices. Taking a panoramic photograph of the crowd using a Galaxy S III was a great way to highlight one of the USPs of the device whilst also encouraging users to visit Samsung’s website to learn more about their handsets. The Galaxy Note Studio was also a fun concept that highlights one of the USPs of the Galaxy Note’s S-Pen stylus and gives punters a great souvenir to take away with them. The difference in how Coca-Cola and Samsung have marketed their products is primarily due to the differences in the types of products that they produce. For Coca-Cola, the main aim of their marketing activity is to create a brand association with the small surprises and “moments of happiness” in everyday life. Everybody has tried Coca-Cola at least once in their life: it’s a simple product that doesn’t have any pros, cons or technical specifications. The key way of driving additional sales of the product is to create that “subconscious desire” or “craving” for the product. Creating random “moments of happiness” across the festival site was a great way of embedding Coke in the public conciousness. For Samsung, the marketing challenge is much tougher. There are hundreds of different mobile phones out there from lots of different manufacturers – each with their own pros and cons. Different phones have different designs, different specifications and different unique selling points – essentially they’re complicated products and the key challenge is standing out from the crowd. 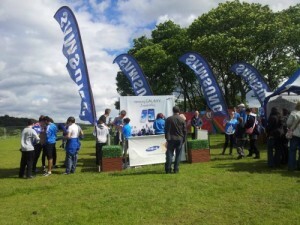 At the Torch Relay festival in Leeds, I felt that Samsung did a great job of highlighting the USPs (unique selling points) of their product in a fun and easy-to-approach way. 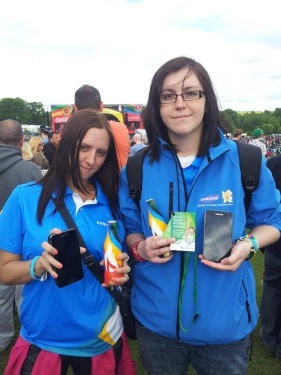 Christine and Stacey showing off their souvenir Coke Bottles, Lloyds TSB lanyards and Samsung Galaxy Note smartphones. The Olympic Torch is due to arrive at the Olympic Stadium during the London 2012 Opening Ceremony. 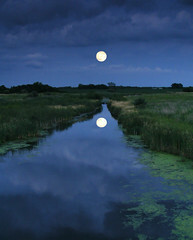 This will be on Day 70 of the Relay (27th July 2012). The European Parliament passed into law a new set of telecoms regulations today. This creates a few new consumer rights and as such we could be seeing some changes in the mobile industry in the months to come. What’s going to change for consumers? Switching networks: Currently you can switch between networks and take your number by requesting a PAC code. It can currently take up to two days for the request to be processed; this has been cut to just one day. Contract length: We’ve seen the move towards longer mobile contracts. First we had 18 month contracts which rapidly became the norm and now we’re seeing a lot of 24 month contracts. We’ve even seen 36 month contracts in the market. The new regulations mean that customers must have the option of choosing a 12 month contract and contracts cannot be longer than 24 months. Various personal data & privacy changes. 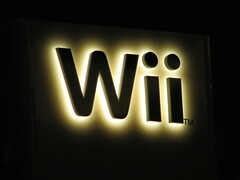 If you’ve got a Nintendo Wii console, you can now download the “Internet Channel” for free. The Internet Channel allows you to browse the internet from your console. But you’ll more likely be using it to access BBC iPlayer or YouTube on your television. The Wii Internet Channel previously required 500 Wii Points. Starting later in October, Nintendo will be offering a NES title from Virtual Console worth 500 Wii Points to those Wii owners who have already spent 500 Wii Points on the Wii Internet Channel. Go to the Software download channel in the Wii menu. It’s great for checking a few things on the internet for a short period of time – not so great for browsing for an extended amount of time. One benefit of the Wii being plugged into a TV screen means you can get your video on demand services such as iPlayer and YouTube onto your large TV screen rather than a small computer screen. How do I access iPlayer or Youtube? What’s the video quality like? Less than great, unfortunately. Wii’s Internet Channel doesn’t support the latest Flash video codecs so video is delivered using older codecs. This is one place the Internet Channel falls short. If you’re a regular Facebook user, you might have come across adverts where their friends are included in the advert. If you’ve got a Facebook application installed or you’ve become a “fan” of a corporate Facebook page, you consent to your name being used to endorse the company in adverts on the Facebook website. Some people won’t like the fact that their name and photo is being used to endorse a commercial product without their express consent. If you belong in this group, opt out of being in Facebook ads. Go to Settings -> Privacy -> News Feed and Wall -> Facebook Ads -> Appearance in Facebook Ads and select “no one”. Thanks to reader Ryan for the tip. Music streaming to be incorporated into Top 40? The BBC report that music bosses are considering incorporating music streaming into the Top 40. That would mean listening statistics from Spotify, Deezer and other top music streaming sites would be considered in calculating the most popular songs. The Official UK Charts Company said it was “bound to” include streaming and subscription services at some point, but not for at least another year. Because listeners do not pay per track – if at all – those plays would be likely to carry less weight than normal sales. It’s a change which would totally shake up the charts. At present, songs are considered for the charts at the point of sale. By considering music streaming, songs are considered at the point of use. It’s an important distinction. Take Pink Floyd – chances are not many people are buying Pink Floyd music at the moment: there are no new singles or albums being released. Yet, many people are listening to Pink Floyd at the moment. By shifting the focus from point of sale to point of use, there would be a huge change in the charts, benefiting popular artists who produce timeless music. According to Martin Talbot, managing director of the Official Charts company, “Knowing what a stream is worth compared to a purchase of a download, for instance, is very difficult to identify at the moment, but that’s obviously going to be the next step,”. This is going to be a big problem. Whatever weighting is assigned to streaming, it is going to be possible for people to manipulate the charts by incessantly streaming the same song. I remember when downloads were added to the chart: there was a big campaign to try and get The Wurzels into the charts. It never happened in the end: it took too many people to part with 99p for the prank to have worked. However, it’s not hard to convince a million people to stream a song from Spotify when it’s free. In fact, post a link to a song on Twitter and most people wouldn’t even know what the song is until after it loads. A Twitter meme can easily influence the charts. The good news for consumers is that this is likely to increase the number of songs available for streaming. At present, there are big gaps in the catalogues of Spotify, Deezer, and other music streaming sites. Once streaming becomes part of the chart, I believe music companies will be much happier to open their catalogues to these sites. Because otherwise their competitors would have a huge advantage in the charts. I’ve argued many times on this blog that it is disproportionate for somebody to lose their internet access for copyright theft. Regular readers will know that France had passed a law which would mean people would lose internet access after downloading pirated material three times. I argued that this was unfair – it stops somebody from participating in online shopping, banking, communications, etc. 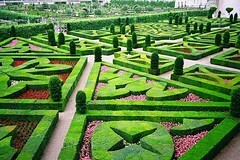 And it seems like the French Constitutional Court agrees with me by ruling the new law unconstitutional. “Moreover, whereas under section nine of the Declaration of 1789, every man is presumed innocent until has has been proven guilty, it follows that in principle the legislature does not establish a presumption of guilt in criminal matters,” wrote the Council. This basic principle applies “to any sanction in the nature of punishment, even if the legislature has left the decision to an authority that is nonjudicial in nature. So that’s great news for the people of France. I feel it is very important that we begin to have electronic rights enshrined into law. Just as the right to free speech and to participate in society are fundamental tenets in modern society, our laws need to be updated to reflect the fact that electronic communications and technology play such a large role in our everyday lives. To reiterate: I don’t agree with piracy or believe that copyright theft is a good thing. I believe that it is important that our rights don’t get eroded as society becomes digital. BBC News reported yesterday on research carried out by the Communications Consumer Panel showing that UK consumers are increasingly considering broadband to be an essential utility. The chair of the Communications Consumer Panel Anna Bradley said: “The key message is that people think broadband is at a tipping point. 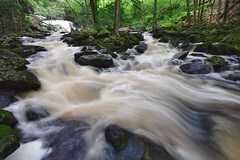 “It’s fantastically useful for everyone, essential for some now, but will be essential for everyone in the near future. Those questioned in the survey said people who did not have broadband would be at a disadvantage, missing out on services such as shopping, banking and public services as they were increasingly being delivered online. I’ve argued before on this blog, several times, that I believe internet access should be a fundamental right. 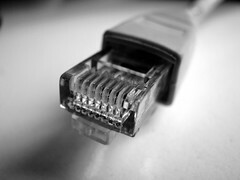 Internet access is becoming a pre-requisite for being able to participate in society: being able to manage your bank account and finances, apply for a driving license and passport, keep in touch with friends via social networking sites and email, accessing entertainment via iPlayer and YouTube and shopping online at Amazon or eBay. I’ve argued that it is disproportionate for somebody to lose their internet access for copyright theft, like in a draft law in France. It would seem like the British public agree with me on this one and our MEPs are backing us. Let’s hope that our digital rights continue to be protected. New Scientist reports this week on a study which looked for a correlation between how “friendly” somebody was percieved to be and how “friendly” their Facebook profiles page appeared to be. University students considered likeable by people that met them in real life have been found to make a similar impression on people who view their Facebook profiles. “People who were expressive in tone of voice and facial expression were also socially expressive on Facebook. They posted a lot of pictures, they posted photo albums, they seemed to have a lot of conversations with people,” says Max Weisbuch, a psychologist at Tufts University in Medford, Massachusetts who led the study. I suppose it’s interesting to quantify, but not particularly surprising. People don’t make things up on their Facebook profile because their network is full of people they know well. It would be interesting to see whether the same relationship could be seen from somebody’s tweets or their Myspace profiles. I suspect that the relationship is stronger for Facebook because it’s based around keeping in touch with people you know – as other social networks have more of an emphasis on meeting new people, people may be more tempted to portray “idealised” versions of themselves.